Yesterday was my birthday! Hooray! On the left is a notebook featuring Elmo, in the middle a 2012 diary with Joey, and on the right a tote bag with one of my favourite MichaelaKnits photos! I was umming and ahhing writing up this pattern, but I guess I'll have to now! Andrew and I had really wanted to go to Antwerp this summer for a whole range of reasons, but didn't end up having the chance. As such, I missed out on this exhibit, but am pleased as punch to have the book. From what I can gather, it goes through each item through history, looking at both the design and construction ideas. I'm so excited to read it! We were out of the house all day, I'd been planning for weeks to spend the day at Richmond Park. We'd paid a visit last year at the end of October, but really missed the bulk of the mating behaviour (my now abandoned PhD was in sexual selection, mating behaviour is kind of my thing!) This year, we went at peak time, and got to see some real treats. But mostly we wanted to see the deer. We first spotted a medium sized stag limping heavily through the trees (inevitably he'd been fighting), and later spotted this fellow having a rest. He's a fairly big stag, but didn't have a single female with him. I can only assume he'd challenged or been challenged by another male soon before, and had come off the loser. He was great though. One of the advantages of seeing the deer in Richmond Park is that they are used to people being around them, and as long as you stay quite far away (photos are zoomed in) and make sure they can hear you coming, they are unlikely to spook and run off, or worse, turn and attack. We came back later and found he'd dug this little hole for his nap! A huge group of females (probably close to 40) guarded by one large male. This won't be the largest harem in Richmond Park, the male doesn't look nearly as big as he could be, and a lot of the females are probably too young to mate. He spent much of the time we were watching chasing off a relentless invasion of 4 very young males, keen to cash in on his hard work! I read once that a stag can lose up to 20% of his body weight during a busy rut, he is kept so active chasing away and fighting with other males. This seems like a massive amount to lose during the autumn, so I'm not sure it's true, but I can certainly believe it's possible! After the park we ventured off for dinner and cocktails to celebrate. We enjoyed a lovely Mexican meal and some yummy cocktails (I followed that up with some "Aztec Chocolate Cake" - which was as amazing as it sounds!) and then collapsed into bed, very tired by all the festivities! This Saturday, following a busy week and some Friday Fashion Week excitement (more on that tomorrow), I took the long journey to Newcastle to watch my Dad and brother Dominic compete in the Bupa Great North Run. This is Britain's biggest half marathon, run this year by 54,000 runners and headed up by some of the biggest names in distance running. My Dad first ran this, alongside my Grandad, in 1982, the second year of the race, at the age of 29. Now, 29 years later (at the age of 58), he ran with my brother (who, for completeness sake, is 21). Dad and Grandad ran the half marathon in 2 hours 20 minutes, and this time round the target, taking into consideration the much larger crowd (54,000 vs. 14,000), my Dad being a bit older than my Grandad was, and my brother's rather unconventional training schedule, the target was around the 2 hours 45 mark. Mam and Dad now live in Newcastle, so we were fortunate enough to be able to walk to the start line, after some essential stretching of course! And the obligatory plastic clothing. And again at the end! We saw them finish, triumphantly crossing the line together, but I was too excited to take a photo, hopefully this one from 30 seconds later will suffice. Dad and Dom finished in 2 hours 48 minutes - almost exactly on schedule when you consider they had to stop and chat to family 3 times!! Today they're very stiff and very tired, but very very proud. They've got medals and t-shirts and support coming from all over (thanks so much to those who tweeted their support!) Dom has been told that he has to run it again with his son in another 29 years! I have finished my new socks! Hooray! Having been so busy knitting lately knitting garments I needed a little light relief. These socks were knit as part of the Easyknits.co.uk X-Factor 2011 Mystery KAL Part One (try saying that with a mouthful of mushrooms!) This has been my first mystery KAL and my first KAL that I have completed on time! 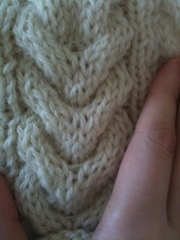 Knit using 2.25mm needles for a 66st CO using Easyknits.co.uk Twinkle yarn in Lemon Ice. The only mod I made was to switch in a short row toe (I don't mind the grafting). This, being slightly shorter, gave me more length to play with the zig-zag and arrowhead patterns. Jon is doing two further X-Factor KALs, the next one begins of Friday and uses 2x100g skeins of sock in 2 colours, and the third begins when the X-Factor live shows begin (not sure when) and uses 1200m of lace - but don't worry, that one's over 11 weeks! You can check out the thread over at Ravelry.com. The pattern will be available to purchase from Jon's Ravelry Shop and via the Easyknits website shortly. Some of you will recognise this as the Knit Nation logo and know that this was a lovely (and beautifully presented) biscuit based gift from Alice as a thank you for helping out at Knit Nation. She even wrote this lovely blog post about me the other day. All of this does of course prove, that she is a very kind and generous silly billy. Because I am incredibly lazy, and wouldn't have helped at all (well, maybe a little bit) had it not been some of the most fun, happy and rewarding days I've had. I met some amazing people, laughed as hard as I have in months, and did more to boost my fledgeling design career than in the previous 4 months put together. Just in case you thought I'd given up on knitting altogether, I can confirm that I have been working very hard! There have been a few secret projects, and a couple of new garment designs in the works, the first of which is the now completed Ropery Pullover. I blogged about this back in August when I was 2/3 of the way through, but was held up knitting the front - it's construction is highly unusual and required some lateral thinking! The second garment is a new, flared, almost vintage inspired blazer design featuring lots of horseshoe cables and knit using Blacker Yarns Pure Galway Aran. I haven't knit with Blacker yarns before, their reputation for rustic, earthy yarns is deserved. I almost certainly wouldn't have picked it up in store, in the skein it is stiff and scratchy, but I would have absolutely missed out. The yarn softens immeasurably as it's knit, and still further when blocked. At Knit Nation Judith McKenzie told me that any good pure wool needs a bit of wear and tear to reach it's potential, and I'm certain that this yarn is going to just improve and improve. I was fortunate to get a great deal on this yarn due to a voucher in Knitting magazine this month, so check that out! 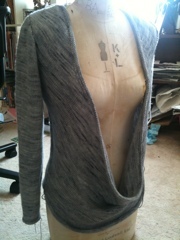 The cardigan is knit bottom up in one piece to the armholes, and then split front(s) and back. Sleeves are worked flat (I think). The garment is finished with a large lapel collar and shoulder pads will be recommended - I loves me a huge shoulder! Thirdly I've been knitting away at the Easyknits.co.uk Mystery X-Factor KAL. I needed a small, non-secret project for Knit Night and the tube, and this seemed like a lot of fun! 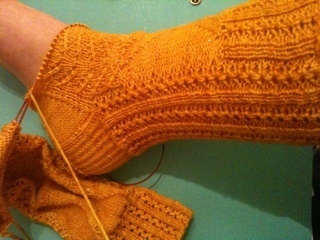 The socks KAL is nearly finished now, but Jon is planning 2 more mystery KALs for between now and Christmas. If you're interested, check out the Easyknits group on Rabelry for more. This photo is from the end of Clue 2 (of 4) - unsurprisingly yellow - using Easyknits.co.uk Twinkle yarn. As a quick addition, I've written the bulk of this post on my phone, using the new Blogger iPhone app. I can see this being very useful, however there's currently no photo placing option, so I've had to come on the PC to move the photos into the right order/place. If in future you see posts with all the photos at the end, you'll know that's how I've written the post! Long time blog readers will remember that last year, in commemoration of British Wool Week, Saville Row was transformed into a mini-petting zoo and I was treated to a wonderful behind the scenes tour of Huntsman, one of the "old guard" of Saville Row tailors. It was truly awesome, if you didn't read it then, you can check it out here. This year, a special exhibit of wool usage throughout fashion has been set up in Pall Mall. Entitled Wool Modern, this free exhibit features some fantastic examples of wool use in fashion, art and home furnishings. The website is http://www.campaignforwool.org/woolmodern/ , in fact, the whole Campaign for Wool website is worth checking out. The exhibit is slightly smaller than I had imagined, however this may be due to it being split across two shop spaces and a small upstairs room. There are a large number of pieces on display, probably about the same number as were at the V&A Yohji Yamamoto exhibit I went to earlier in the year. To be honest, the exhibit is worth the trip for the fantastic free guidebook alone (I do always appreciate free stuff, must be that student attitude still clinging on!). This features photos and descriptions of each of the items on display, and will be a useful reminder for the future. Think of a well known British designer and chances are they had something at this exhibit, from McQueen, to Westwood to Pringle. Smaller labels such as David Koma were featured too, as well as well known individual items such as Sibling's Knit Monster. Many European labels were represented too, such as this gorgeous wool dress from Lanvin AW10/11. I love this so much I've already convinced Andrew he needs to make me one! Other highlights included this gorgeous dress from Galliano AW10/11, sadly obscured in the exhibition by a jacket, but you have to love that skirt shape! To the right is a Sonia Rykiel AW05/06 look in the most fantastic tweedy yarn. Another close up now of some graphic colourwork on this Mughler AW 93/94 catsuit that I think is just great. I don't think even the most patient of knitters would want to knit at this gauge, but I can't help but be inspired. As a special treat, the exhibition houses this 1965 YSL couture gown (if you can call it that). The blurb states that it uses 150 balls of wool, whatever that may mean. Highly impractical to wear, I may just like to have it as my coffin. Last but not least, this dress by Mark Fast AW11/12 (so not yet in stores!) I've been playing with pleats a lot lately, and it's nice to see them taken to the extreme in this way. In the past I've been rather vocal in my opinions on Mark Fast's brand of knitwear, but I have to concede that he does seem to be growing as a designer. This dress features only a small section (ableit on the crotch) of his trademark openwork nonsense. I was fortunate to be able to visit with both Andrew and my friend Ali, who has a very well written craft blog over at In The Making that I highly recommend. It's always nice to get other's opinions on these things, and generally we didn't agree on our highlights! Ali loved the McQueen and the Alice Palmer, while Andrew was more taken with the Rick Owens (no surprise there) and the men's Lanvin. In short, if your in London between now and the 28th of September, go and see this exhibit! Knitwear designer Michaela Moores! I live in Antwerp with my lovely boyfriend Andrew and our 2 cats. For more information, visit About MichaelaKnits.